A team from Westwood Golf Club has won the HOUGHTON SALVER, which is a major competition in the North Staffs & District Golf League. They beat Malkins Bank GC in a Greensome foresomes format by a resounding 3-0 score line at Wolstanton Golf Club last Saturday. 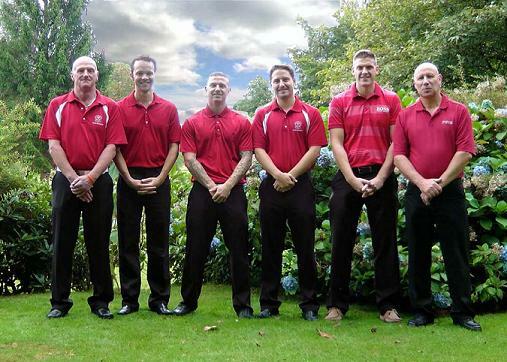 The team was made up of members (left to right) Paul Campion,Richard Pigott,Dennis Vincent,Mike Bowcock,Mark Sheldon & Bob Woodward. The season long competition was played through from April to September. In previous rounds the team won away at Onneley GC, at home to St Thomas’s Priory GC from Rugeley, away at The Chase GC at Cannock and in the semi-final away at Newcastle GC. Other members who played in previous rounds were Chris Bentley, Danny Rider, Dave Alcock and Simon Murfin. Its not an illusion "Dennis is really 5ft 4" tall"